Chloe Pate is a first year Paramedicine student from Shepparton in Northern Victoria. 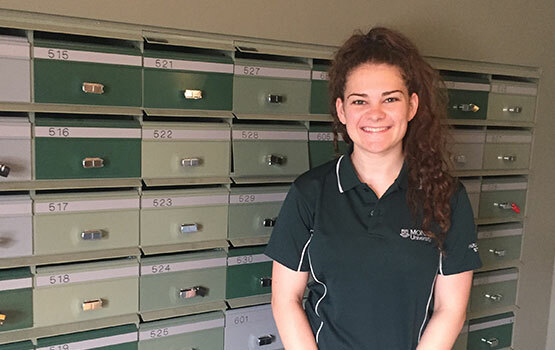 She lives in the new Peninsula residential accommodation and praises Monash for providing her with a lot of information about living on campus in the lead up to her arrival. “My parents helped me move in and this is my first time living away from home. Monash helped really well with the transition,” says Chloe. It’s only a week into her studies and Chloe’s is enjoying her experience living in the new accommodation. “I love the studio apartments. I really like that we can use the communal kitchens with the bigger bench space on each floor. Everything is very clean and there is also a lot of sitting space to chill out,” says Chloe. Before arriving Chloe experienced the usual nerves that come with starting university for the first time and moving out of home but these quickly faded. She threw herself into enjoying many of the orientation activities arranged by Monash Residential Services, including the city scavenger hunt and beach day. Before coming to Monash, Chloe researched the Bachelor of Paramedicine and is now enjoying being around like-minded people. Chloe’s future ambitions include working as a Paramedic and then applying to become a Mobile Intensive Paramedic (MICA).